Saluda River Club has recently introduced its new Club Villas concept that will appeal especially to single professionals who plan to select their next home based on the home’s design, features and neighborhood amenities – as well as on a sense of comfort, connection and true community. Andrew (“Andy”) D. White, developer of Saluda River Club, sees this collection of five Club Villas around one shared courtyard as an entirely new living option within the award-winning master-planned community just a few miles outside Columbia, SC. Though fully detached, each home will feature a side entry gate to the courtyard area that will be shared by the five homeowners. At 1,506 sq. ft., each beautiful Club Villa, located in the Village District, includes 2 bedrooms and 2.5 baths. Upon entering the well-crafted new home, check out the 9’ smooth ceilings, stunning hardwood floors, and custom moldings throughout. 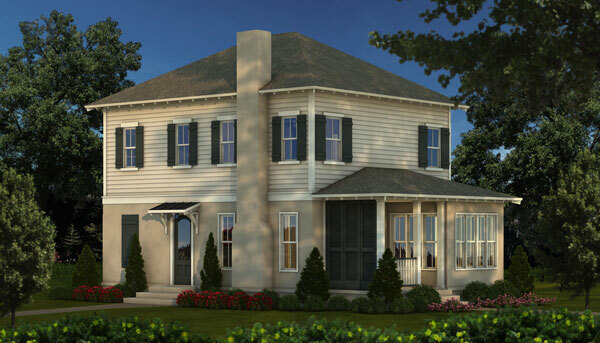 In addition to the master bedroom and master bath on the first floor, each Club Villa features a fabulous great room, porch, plus a well-designed, generously laid out kitchen and café. On the second floor, buyers will find a second bedroom and a full bath, as well as a large room that can easily be turned into an office or craft room, plus a good amount of (unheated) storage space. The spacious kitchens of the Club Villas feature luxury stainless steel appliances including a gas cooktop, a granite-topped island that seats four, pantry, and a plethora of custom cabinets. The kitchen opens to the family room and the café, a comfortable, casual area that is suited for a leisurely breakfast or to enjoy an after-hours glass of wine with friends. The café features plenty of windows that bring in the outdoors. The elegant master bedroom features a large walk-in closet and a door separating the bedroom from the bathroom for privacy. The sparkling master bath is designed with a private water closet, separate vanities, large tile shower, and a generous linen closet. To learn more about the new Club Villas and other brand new homes currently available at Saluda River Club, please schedule a visit soon. For more information or directions, please call 803-358-3969 or visit www.saludariverclub.com.